Ingredients: Red Chilli, Coriander, Salt, Paprika, Turmeric, Cumin Seeds, Dried Mango, Dried Garlic, Dried Ginger, Black Pepper, Clove, Cinnamon, Mustard Seeds, Curry Leaves, Bay Leaves, Kalonji Seeds, Fenugreek Seeds. • Fry onion in ghee until golden. • Add tomotoes and fry for a few minutes. • Add vegetables and Sabzi/Bhujia Masala, mix well, and fry for a few minutes. 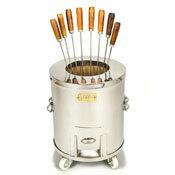 • Add desired quantity of water (if required/necessary) cover and cook on a low flame until tender and ghee sperates. Garnish with chopped coriander leaves and/or chopped green chillies as per your taste. 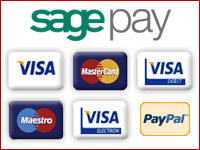 • For Masala Vegetables - remove the onion from the above recipe. 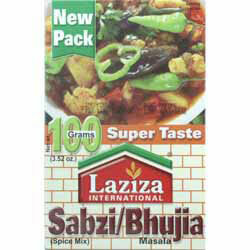 • You can prepare a variety of vegetable dishes from Laziza Sabzi/Bhujia Masala.